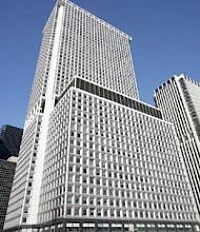 1 New York Plaza is an office building in New York City, built in 1969, and is located at the intersection of South and Whitehall Streets (40°42′08″N 74°00′42″W﻿ / ﻿40.70214°N 74.01175°W﻿ / 40.70214; -74.01175). It is the southernmost of all Manhattan skyscrapers. In 1959 the City of New York attempted to acquire through eminent domain the land under this development as part of the Battery Park Urban Renewal Area. The Philadelphia Savings Fund Society (PSFS), originally called the Philadelphia Saving Fund Society, was a savings bank headquartered in Philadelphia, Pennsylvania, United States. 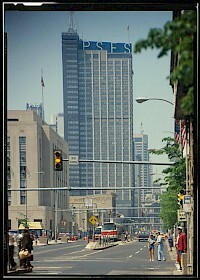 PSFS was founded in December 1816, becoming the first savings bank to organize and do business in the United States.